A great triumph of the Zadistes when on 17 January 2018. 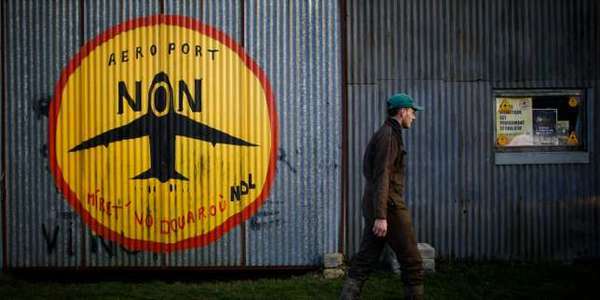 Prime Minister Edouard Philippe announced that the airport project of Notre-Dame-des-Landes, was given up, definitively suspended. 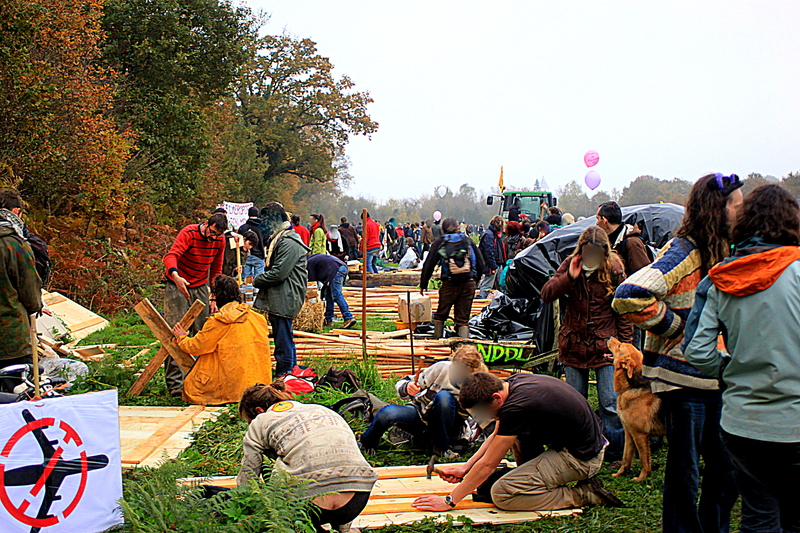 The resistance over many years gave rise to a new word in French, "zone à defendre", ZAD. The zadistes around the world congratulate themselves on this victory won at a cost of great sacrifices. The Aéroport du Grand Ouest Project was a planned new airport, to be situated in the NW of the city of Nantes. It is intended to replace the currently operating Nantes Atlantique Airport and also serving as an international gateway for western France. The project is backed by the French state (it has been indeed declared of "public interest" in 2008) and dates back to the early '60. Once the plans got knew to the local inhabitants, opposition started in the '70. Thanks to the oil crisis and the strong opposition, the project was suspended. However, in 2000 the project was recovered under the Lionel Jospin government, declared as of "public Interest" in 2008 and Public-Private Partnerships have been encouraged. Along with the airport, many more infrastructures were planned to be built there, such as high speed train lines to connect Nantes with major French cities. The opposition is mainly formed by farmers, locals and environmental activists; they strongly opposed the idea that such large infrastructures need to be build for the sake of the national economy and that public money are spent for such purposes. According to the Syndacate Mixte accounting the project, the cost of the project will be distributed as follows: 315 M€ (56,6%) by Vinci (the contracted company); 241 M€ (43,3%) by public funds; 125,5 M by the State; 115,5 M€ by the "collectivités territotiales". They also denounce negative impact on climate change, as well as the fact that it will affect unspoilt areas of France (forests and plains of Rohanne and Fosses Noires and the bocage de Notre-Dame-des-Landes), as well as what is now a quiet farming district. The lac de Grand-Lieu, belonging to the Natura 2000 network, will likely be heavily affected as well. Main action against the project consisted in transforming the so called Zone d'ámenagement Differé into the Zone á Défendre ("Zone to be defended"); activists and families squatted farms and fields and set up alternative activities, built straw-bale houses, upcycled sheds, theatres and bars cobbled from industrial pallets, hobbit like round houses and so on. They promote tallers and conferences, and advocate for a different use of the territories, not only questioning the need for new large infrastructures but also refusing the idea of an economy based on them. After relevant protests, mobilization and squatting -including a five month sentence of an activist- on April 2013 an indefinite postponement of the project was announced by the authorities. Yet demonstrations and action against the project continue. The mobilizers (or "zadistes") have been active actors in the formation of the European network of Unnecessary Imposed Megaprojects and hosted its second international meeting, the 2ème Forum Thématique Européen contre les Grands Projets Inutiles Imposés. Project Details Capacity will be up to 5 million passengers per year. Development of Alternatives It was suggested by ACIPA to refurbish and enlarge the exisiting airport Nantes-Atlantique instead of building a new one. This assertion is supported by the the report issued in 2011 by the consultancy CE Delft. Why? Explain briefly. It is a success because the project has been cancelled in January 2018. Huge mobilization, protests, squatting and legal action delayed expropriations as well as led to an indefinite postponement of the project and finally to its end. Decree of concession of the airport facilities of the Grand Ouest region: Décret n° 2010-1699 du 29 décembre 2010 approuvant la convention passée entre l'Etat et la société concessionnaire aéroports du Grand Ouest pour la concession des aérodromes de Notre-Dame-des-Landes, Nantes-Atlantique et Saint-Nazaire - Montoir et le cahier des charges annexée cette convention. Brinke, L. & Faber, J. Comparison with Improvements of Nantes Atlantique. Delft, CE Delft, 2011. Le Monde.fr | 11.02.2016 - Notre-Dame-des-Landes : quel périmètre pour le référendum local sur le projet d’aéroport ? Photographic movie: Occupy this land!